We love LEDs, and apparently so do most of our clients. While there are quite a few professional lighting solutions available, they’re cost and lack of transparency have often turned us off. We don’t always wish to have a computer act as the main controller of the lights, and more times than none we want to build in some form of interaction. 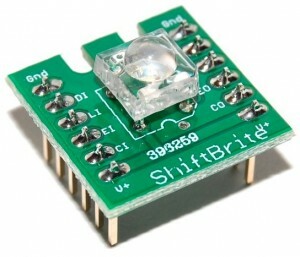 So, on our quest for a lighting solution that addresses all our needs, we stumbled upon these great LED units called ShiftBrites from Macetech. Each unit contains a RGB LED and an Allegro A6281 LED controller. 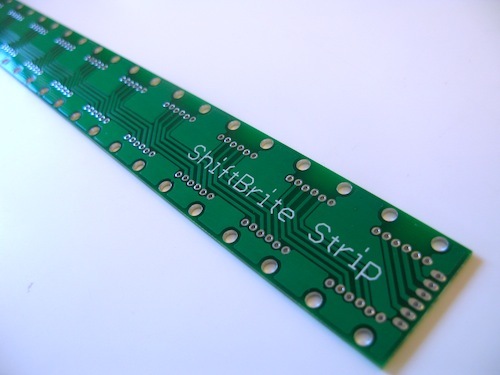 You communicate with it using four-wire SPI and you can daisy chain the LEDs to create long strings for scalability. In short, these things rule.